The human hand is an appropriate part to attach an agent robot. Pygmy is an anthropomorphic device that produces a presence on a human hand by magnifying the finger expressions. This device is in trial to develop an interaction model of an agent on the hand. It is based on the concept of hand anthropomorphism and uses finger movements to create the anthropomorphic effect. 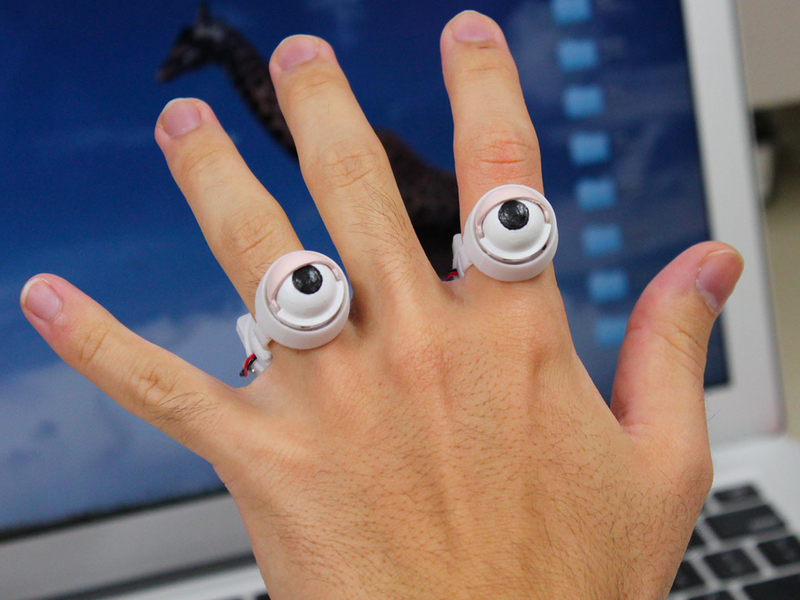 Wearing the device is similar to having eyes and a mouth on the hand; the wearer’s hand spontaneously expresses the agent’s presence with the emotions conveyed by the eyes and mouth. Interactive manipulation by controllers and sensors make the hand look animated. We observed that the character animated with the device provided user collaboration and interaction as though there were a living thing on the user’s hand. Further, the users play with the device by representing characters animated with Pygmy as their doubles.